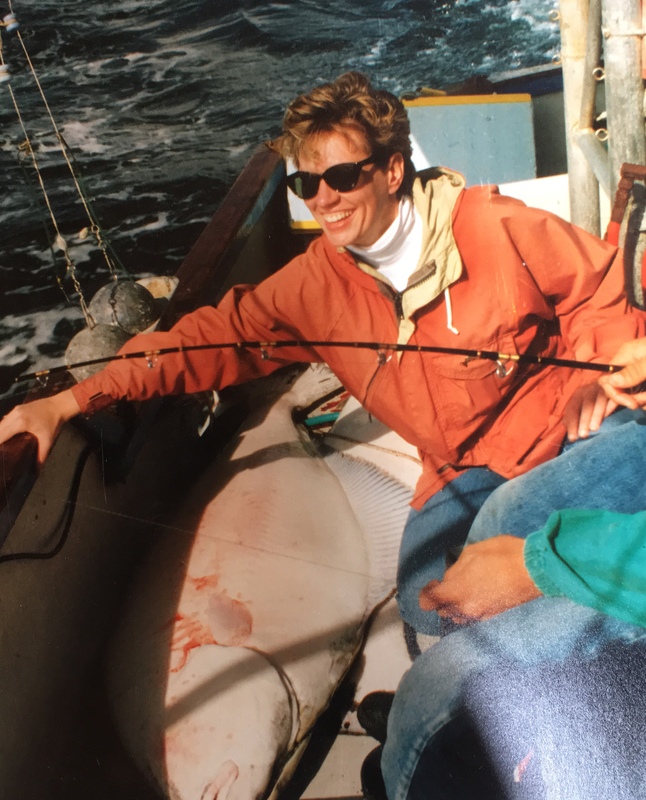 This is Cindi fishing off the coast of Alaska in the 1990. I met her at a Sunday afternoon pool party thrown by my mortgage broker, Bill. The party was filled with handsome young men in speedos. Cindi was the only woman at the party except for Bill’s chef du jour, Betty. In spite of all the handsome and beautiful men at the party, Cindi ruled the roost in a red maillot, high-heeled sandals and a straw hat with a brim the size of Montana. She was reclined on a chaise reading a book while holding Bill’s hand. This left many of the young men wondering if she was Bill’s girlfriend. I had never met anyone like Cindi. I was initially intimidated by her glamour and sophistication. She was running an art gallery and producing monotypes in her studio. It was common to find Cindi’s art hanging in a gay man’s house in Denver. She was always fashionably dressed but never too trendy. Cindi had a passion for Chanel red lipstick but was also an avid outdoorswoman. She would trade four-inch heels for a hiking boots. She could stay at the Four Seasons or camp in desert by herself when she needed to recharge and reflect. She’s been known to wander around the desert naked. One day she would be in an evening gown at a black tie event while the next day riding horses in a high-country canyon. It took a while to get to her know her but a friendship was formed that is still going strong. My ex is in town. I saw his profile on a “dating” website. He’s not wearing his wedding ring in the photos. He shaved four years off his age. At first, I was surprised to come across his profile. After all, he is married to the man of his dreams. Words he used to describe his new husband on social media. I thought about the demise of our relationship and came to the conclusion that, although he has a lot of great qualities, he has some serious issues with honesty. I shouldn’t have been surprised to see his profile online searching for male company. He could be in an open relationship. Or he could just be playing on the side, again. I do believe we woke up the Children. You think the Flower Children of the 1960’s were revolutionary? Just wait. And these children are masters of social media and organization. You’re either with them, or against them. Many of these children will soon be voters so I expect the next election to be a game changer. They know it’s time for change. I know it’s time for change. I’m hoping for a revolution. 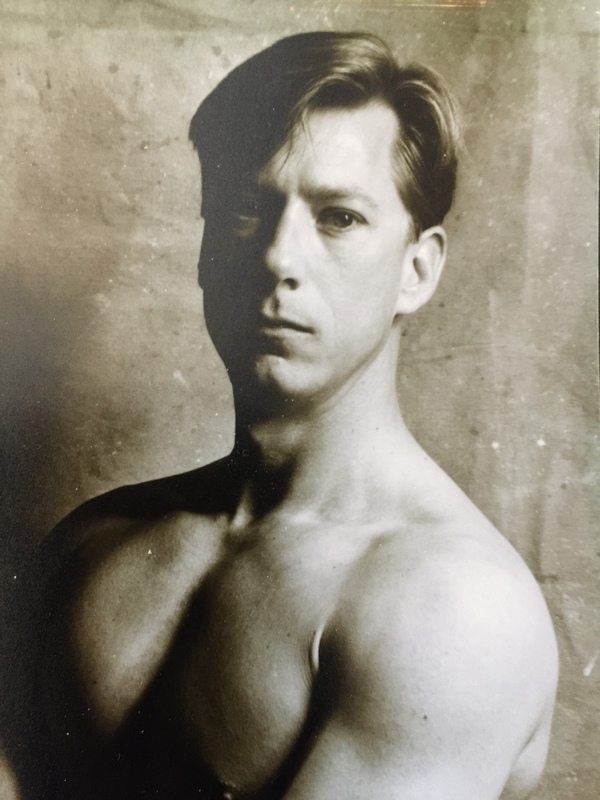 In the early eighties, I was living in Dallas running with a wild group of guys who were white-collar professionals during the week and party boys on the weekend. Most of us were in our late twenties, early in our professional careers. Buying nice cars while living in our first homes instead of apartments. I was climbing my way up the corporate ladder at a telecommunications company. Burton had passed the bar and just started practicing law. Wallace had a good job at a multi-national information technology company. Tom was selling expensive designer furniture at a high-end, to the trade, showroom. Charles owned an antique store. Stanley was an oil and gas accountant. We thought we were invincible. We thought we ruled the world. We were professionals during the week and drug abusers on the weekend. Dancing every Saturday night at the Snake Pit on a concrete dance floor, usually under the influence of some type of drug. MDMA on the low key weekends. Cocaine and other drugs at least once a month. Weekends were full throttle when the contingent from Houston was in town. Drinks and pot were followed by some other drug before heading to the bar. Dancing for hours on end while sucking on ethyl chloride drenched handkerchiefs. Driving home at dawn while the early church goers were headed to first services on Sunday morning. Popping half a Quaalude at home in hope of shutting down and getting some sleep. Party time lasted for about two years. I got sick with what I thought was the flu, only to be told I had AIDS. I stopped drinking and doing drugs. The others continued the cycle until friends started dropping like flies. Eventually, the scene fell apart. Charles, Stanley and Tom died from AIDS. Burton found God, quit law and became dedicated to his church. Wallace got involved in the leather scene and moved in with his master in the suburbs. I had settled down with Dale, an artist and textile designer. Dale died a six months before my company transferred me to Denver. Looking back, it was a foolish walk on the wild side. It’s a wonder no one died of an overdose or ended up in rehab. Instead, they died from AIDS related complications. So much for ruling the world. We were not invincible. We were simply reckless. 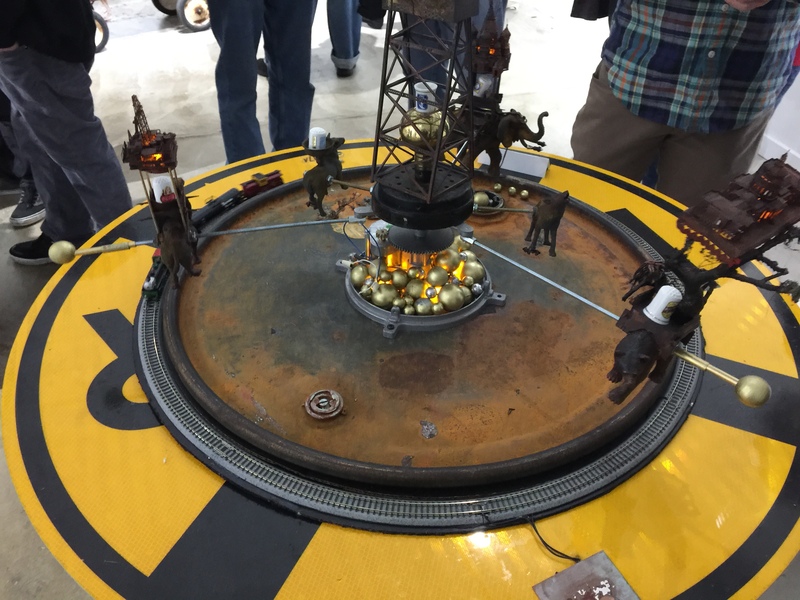 “SMALL CHANGE” is an installation by Brian Cavanaugh toying with content, context and scale using sound, LEDs, motorized turntables and repurposed objects. 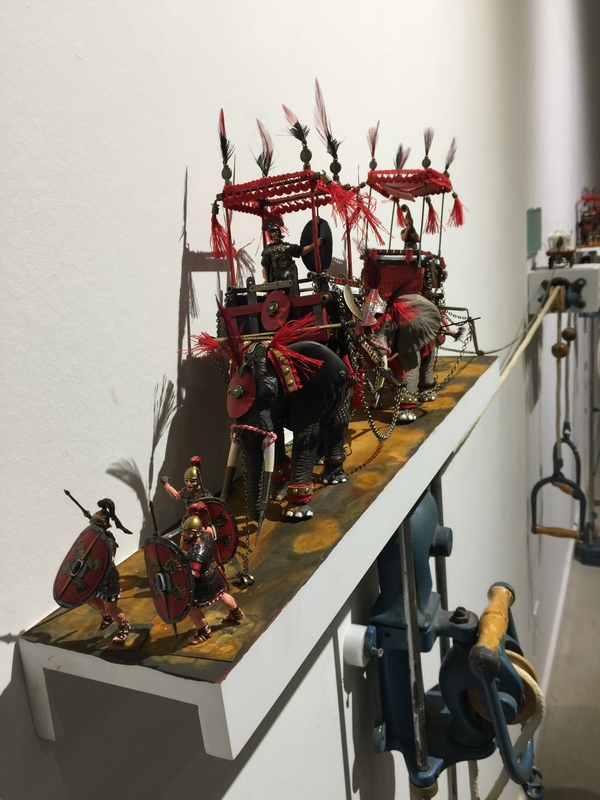 Twelve new kinetic sculptural constructs, one monthly for the duration of 2017, emphasize the cyclical nature of history, nature, and explore culture’s darker carnival atmosphere, where metaphor is ringmaster to a circus parade of divisive disparity on national tour. Cindi was staying with me for last few days. She left this morning for Winter Park before heading back to Santa Fe. We had an early dinner last night before hitting the galleries. I was really impressed with an artist new to the Pirate roster. Vinni Alfonso presented Domestic Beasts as his first show at Pirate. He’s a young emerging talent on the local art scene who has a promising future. Stressle, acrylic and latex on canvas, $1,200. Box, acrylic and latex on canvas, $825.